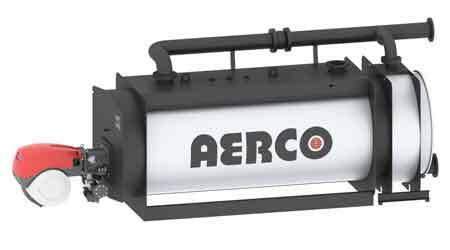 AERCO International, a leading provider of environmentally friendly solutions, introduces its Multi-Fuel Condensing (MFC) hydronic boiler that brings high reliability and cost efficiency to projects and facilities requiring backup fuel. Capable of being fired with natural gas, propane or No. 2 fuel oil (as backup), the MFC is designed for condensing applications in closed loop hydronic systems designed into healthcare buildings, military bases, emergency shelters, industrial operations and similar facilities. Six MFC models ranging from three to 10 million BTU/hr capacities are available. Each unit addresses the market need for solutions that help facility owners and managers achieve greater return on investment (ROI) for heating systems. The boilers have 5:1 turndown ratio when firing on natural gas or propane. A proven 4-pass fire tube heat exchanger is designed for maximum heat transfer and helps the MFC achieve a high operating efficiency of up to 96 percent. Boiler maintenance and system lifetime costs are lowered by the MFC units, which are constructed of the highest quality material. An extremely durable heat exchanger built with a combination of high-quality carbon steel and 316Ti stainless steel offers superior corrosion resistance against acidic flue gas condensation. The heat exchanger’s maximum working temperature of 240 degrees allows it to meet the requirements of higher temperature applications. Additionally, it allows for the system to reset water temperature for condensing in the shoulder months. Fitted with industry-leading power burners, the MFC’s emissions are extremely low while its fully modulating capability helps the solution achieve high energy efficiency, longevity, and reliability. NOx emissions of less than or equal to 40 PPM are possible at all firing rates when the boilers operate on natural gas. Standard dual returns provide greater flexibility, as well as optimize plant efficiency by lowering water return temperatures for a reduction in energy costs, including up to 12 percent savings on seasonal efficiency. The MFC boiler can be used as an individual unit or in modular arrangements that offer selectable modes of operation. In addition to controlling the boiler according to a constant set point, indoor/outdoor reset schedule or 0-10V signal, one or more units can be integrated via Modbus communications protocol. For systems containing two or more units, AERCO also offers an available sequencing controller designed to optimize plant efficiency. The MFC series can be used with the Tekmar Boiler Control 284, which can operate up to four boilers to accurately maintain a target water temperature and create a flexible, cost-effective mixed boiler plant solution. It communicates with a building automation system (BAS) using BACnet or Modbus for remote monitoring and adjustment capability.